After more than a decade of online creative play, massively multiplayer online game Roblox is expanding its user-created content into the real world, partnering with Jazwares for a line of collectible and customizable toys hitting stores in February. Boasting more than 40 million monthly players in December alone, imagination-powered online community Roblox is at the top of its game these days. I’’ve not dabbled myself, but after watching my 10-year-old nephew spend Christmas Eve doing . . . something entertaining with a canon . . . on the Xbox One version of Roblox, I at least understand some of the appeal. Players get to create their own characters, program their own games, build their own objects and make money selling their wares. It’s sort of like a Second Life for the younger set. The toys, launching at retail next month, reflect the creativity and community spirit of the game. 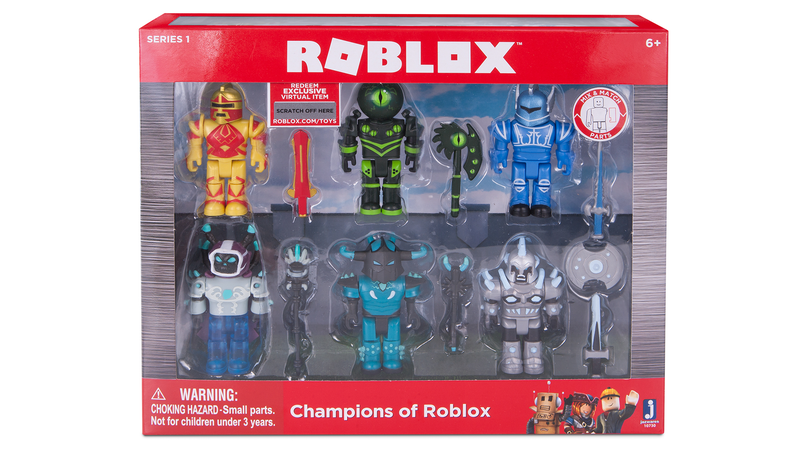 All figures in Jazwares’ line feature mix-and-match parts, with many of the designs taken directly from those created by popular Roblox players. Each package will also include codes for special in-game loot, and the kids love their in-game loot. And now I know what to get my nephew for his birthday. Oh wait, that’s in January. Nevermind, he’s out of luck. He’ll probably be too busy with Roblox to even notice. The Series 1 collection of Roblox toys will be available at retail next month.